The Model 539 Multipurpose phantom is an easy, comprehensive means of evaluating imaging systems with an operating frequency range of 2.25 to 7.5 MHz. The phantom is designed with a combination of monofilament line targets for distance measurements and tissue mimicking target structures of varying sizes and contrasts. Cystic-like target structures are positioned in-line vertically, thereby permitting an entire target group to be displayed in one view. Due to the acoustic similarity of the background material and the target structures, artifacts caused by distortion, shadowing or enhancement have been eliminated. 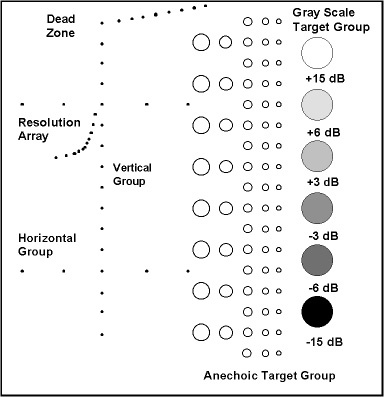 Six gray scale targets ranging in contrast from +15 to -15 dB are provided to evaluate the system’s displayed dynamic range and gray scale processing performance.